A new summer curriculum from DreamUp allows students to continue learning and have fun during the long summer vacation. Summer is a season for children to enjoy, because it is a time when their very perception of time changes. The days seem to pass quickly — too quickly — until the months fade and the memories blur. Summer is the time to fall in love with your town or city: to tour the museums and libraries you have seen from the outside but never entered; to visit your local observatory or planetarium and gaze at the stars; or to escape the light pollution of the city to see the Milky Way. While parents and teachers can encourage students to exercise their minds during the long summer break, a free summer curriculum can help integrate STEM activities into kids' summertime fun. DreamUp, my company, offers a free curriculum that brings space-based research and other projects to students of all grade levels, and it is free to download from DreamUp.org. After immersing themselves in cutting-edge science all summer, students return to class with stories to share about their newfound interests in science and space exploration. For example, DreamUp has partnered with the National Stem Cell Foundation (NSCF) "to create a custom space-based curriculum that incorporates a mimic project for the middle school classrooms of each National STEM Scholar," or 10 middle school science teachers selected for a special program that "provides advanced science education training and networking opportunities for the influential middle teachers of future scientists and engineers," NSCF officials wrote in a statement. Those educational projects focus on the next launch of Blue Origin's New Shepard rocket and a NanoLab microgravity research module that will be on board. "The National STEM Scholar Program will make a space-based curriculum with custom micro- or zero-gravity module[s] available to all current and future Scholar classes," NSCF officials said. But teachers don't have to be part of the national STEM Scholars program to use DreamUp's curriculum. You don't even have to be a schoolteacher – DreamUp.org also has a list of fun science experiments and activities that students can do at home with friends or on their own. If we encourage children to use their summer vacation as an opportunity to experiment, not as a vacation from learning, we will ready them for changes that will influence not only their grades but also their chances at success and their impact on the world. Rather than a 20th century school system, we need one for the 21st century, that embraces the concept of an economy in which science is indispensable, technology is inestimable, engineering is invaluable, mathematics is inseparable to national success and space is not the final frontier but the beginning of a new frontier of wonder. This proposal is more tactile than theoretical. It is more accessible than abstract, because it turns active bodies into active minds. 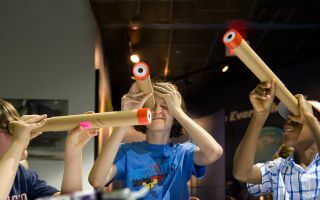 It is an exercise of brawn as well as brains; children can send their own experiments into space or devote themselves to creating the very things destined for delivery and testing aboard the International Space Station. It is also an opportunity to be physically active, to walk, run or hike outdoors; to exercise your body — to reach the mountaintop — so you may exercise your brain and consider the enormity of what you see. If every day feels as wondrous as a perfect summer day, we can improve our schools and increase awareness about the importance of increasing what we know in general. I welcome the arrival of that day.